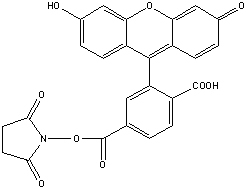 Fluorescent Dyes, 6-FAM, SE, Peptide Synthesis, Custom Peptide - ChemPep Inc.
6-FAM, SE (λex/λem: 495/517nm in DMF) is the amine-reactive succinimidyl ester of single isomer 6-FAM acid. It is one of the most popular green fluorescent reagents mainly used in sequencing of nucleic acids and labeling nucleotides. Compared to 5-FAM, 6-FAM is less often used to prepare small molecules. 1. Sakamoto M, et al. (2003). Application of terminal RFLP analysis to characterize oral bacterial flora in saliva of healthy subjects and patients with periodontitis. J Med Microbiol 52, 79-89. 2. Jordan JA, et al. (2001). TaqMan-based detection of Trichomonas vaginalis DNA from female genital specimens. J Clin Microbiol 39, 3819-22. 3. Brandis JW (1999). Dye structure affects Taq DNA polymerase terminator selectivity. Nucleic Acids Res 27, 1912-8. 4. Mornet, D. and K. Ue, Incorporation of 6-carboxyfluorescein into myosin subfragment 1. Biochemistry 1985, 24, 840-6.